Originally sold in the back of Vampirella, Creepy, Eerie and Famous Monsters of Filmland magazines back in the 1970's, the Vampirella slipcase is a cardboard box with the Vampirella logo on it which would hold 10 issues of the Warren Vampirella magazine. This was the thing to have to keep your Vampirella magazines in good condition (this was before backing boards and comic bags were commonplace - and relatively cheap!). The slipcase measures about 11 1/4 inches tall, 2 1/4 inches wide and 9 3/4 inches deep and was only sold by mail order. This is one of the rarer Vampirella collectibles. Probably because many people saw them advertised and thought "that's a good idea", and then made their own slipcases out of old cardboard boxes covered in sticky backed plastic for a fraction of the price. Well, that's what I did, anyway! In retrospect I should have bought at least one slipcase ... oh well, I suppose that hindsight is better than no sight at all. This was an extra for the collectors of the Topps Visions of Vampirella Trading Card set. A large folder, there is more than ample room to hold all the Visions cards (including a complete duplicate set with the gold logos) and still have a loads of room left. When you bought this folder it came with a special promo card (P 91) to get you started. 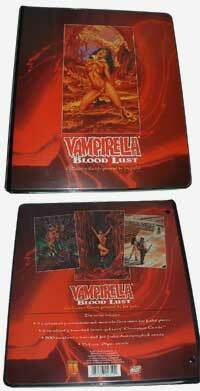 Again, a folder to collate and protect your collection of Blood Lust cards. This folder is a much better size (half the thickness of the Visions folder) and holds all the cards in their protective sleeves - plus all the promo cards and other related stuff that goes with the set - without the pages flopping about. Though I can appreciate that someone obviously treasured their collection of Vampirella magazines so much that they decided to bind them into a series of leather bound volumes, I would fear that these comics could be damaged by the process. This looks like each magazine has a steel rod pinning it into the volume, and over time that rod could rust and affect the pages of the magazine. Each volume contains ten magazines, and there are four volumes that I have seen. The first 40 issues of Vampirella bound in leather were offered on eBay at $499.00 for each volume.